Suchetana Banerjee: Today we have writer, translator, theatre critic, film critic Samik Bandopadhyay with us to discuss Utpal Dutt and his theatre. Thank you, Samik da. To start with, Utpal Dutt is a phenomenon in Bangla theatre. We can’t term him just as an actor or as a dramaturg or as a playwright but he was all in one. How do you think, in which field do you think he excelled the most, how do you see him, largely as a playwright or as a dramaturg or as an actor? Samik Bandyopadhyay: That is a very interesting question. I would consider Utpal Dutt as a dramaturg in the new modern sense of the dramaturg and dramaturgy that has been evolving and has taken a definite shape by now. Where a person conceives a theatre in its totality particularly in terms of its making and its impact coming together, the bridging of the two. This entire experience and this entire experience set in a historical understanding, in Utpal Dutt’s case, also an ideological understanding of this entire phenomenon of theatre. That is the role of the dramaturg. And I think Utpal Dutt bore on himself, carried on himself that role. And he is, I would say, singular in the Indian theatre experience, in that sense. He is our dramaturg, the dramaturg, the only dramaturg of the Indian theatre. Because one of the handicaps of Indian theatre, one of the traditional burdens that modern Indian theatre carries, has been the burden of the actor-managerial tradition which we inherited from our colonial knowledge system. And the actor-managerial tradition harps on, emphasises on and builds upon the actor at the centre of the theatrical experience and everything else is thrown aside in the process. It is the dominance of the actor, the presence of the actor, the triumph of the ego of the actor which becomes the central theatrical experience, and the ego of the actor is presented and the audience is supposed to reverentially lap it up. So Utpal Dutt consistently—whatever be his other limitations, there are several contradictions in his entire career, we can talk about that—but the fact is that he remains our single dramaturg throughout his theatrical career and again he grows into being a dramaturg. So that process, that evolution of a modern dramaturg in Indian theatre, he theorised, articulated with great clarity. S.B. : I would like to do something more than what you asked me for. I would like to place him in a kind of a contrast to another contemporary who has also played a very important part in the history of modern Indian theatre, Ebrahim Alkazi. Alkazi was born in 1925 and Utpal Da was slightly younger than Alkazi, but more or less contemporary and you can see the parallel trajectories. Both are educated in Jesuit schools, very specifically St. Xavier’s in both cases. The same kind of education. The surroundings in which they grew up, similar to a great extent what we popularly call ‘anglicised’. That is the inheritance, that is the convention in which they come upon, well, on the stage. And then you see the two different trajectories. Alkazi remains bound within it. Takes the route which would be inevitable if you follow that course, goes to the Royal Academy of Dramatic Arts in London, one of the rare Indians who completed a full-fledged RADA course, took pride in his RADA training. And Utpal Dutt moves out of that fast enough but has a very interesting intermediary exposure: his work with the Shakespeareana, Geoffrey Kendall and his company, not RADA trained at all. It’s a different British convention outside the RADA. A convention of the strolling players which is really a 19th-century development in England where the actor-managerial tradition had been institutionalised at the beginning of the 18th century, David Garrick and after. It is a kind of a reaction to that when theatre becomes totally institutionalised, high ticket rates, elaborate scenographical work and at the centre, the actor, the star actor—strongly patriarchal, the way the actresses were used and presented and exploited. Outside that tradition, the strolling players and those who are strolling players have to camp anywhere, everywhere, in the villages and in the small towns. So those kind of patriarchal distinctions, authoritarianism, they cannot work in this kind of theatre. This theatre has to be popular and democratic. And at the same time the texts that they take, the texts that they carry to the people are classical texts, primarily Shakespeare rather than the late 17th-18th century social comedies, the comedy of manners which became more central to the British actor-managerial tradition. So that is a tradition, a very different tradition from the tradition of the RADA, with which Utpal Dutt associates and takes his first lessons from in a way. And all his life, till the end of his life, he acknowledged, used the term even of guru for Geoffrey Kendall. But even before this exposure, immediately after he graduates from St. Xavier’s, there is this historic production, his modern dress Julius Caesar acted, ironically, on the St. Xavier’s stage, but barely four years—this was 1949—barely four years after the end of the Second World War, barely five years after the fall of Mussolini and fascism in Italy. He does a Julius Caesar where the followers of Mark Antony, the demagogue, are fascists, are blackshirts. You have to remember that the audience in Calcutta, the audience to which he was playing, was aware of this history. This history was a very recent history. The memories were still alive. And even in his use, as you probably know, for the forum scene instead of a crowd gathering on stage which would have never conveyed the visuality or the oral quality, the oral richness of a mass gathering, what he did, he used four/five radio sets on the stage and people gathering before the radio sets and listening to the debate. Which again is a product of history because it is the Second World War which made the radio broadcasting so seminal and so powerful and so daily a media for the people all over the world, because the Second World War was moving so fast from frontiers that people couldn’t afford to wait for the morning newspaper the next day, the war might hit them even before that. So the urgency of listening to the radio, the radio became something of a mandatory, daily experience for people all over the world. And you can see it in the great films of the period, you can see it in The Great Dictator, it starts with the radio, it ends with the radio. You can see it in the classic Casablanca, the radio is all through it. So the centrality of the radio which is so important to the politics of the period, the media politics, the democratic politics of the period, incorporating that in theatre for the first time ever in our country. So making that experience a Shakespearean experience, a contemporary political experience and the political overtone which it carried, the ideological layering that it had at that point in this interpretation, in this fresh reading of Shakespeare’s Julius Caesar was the fear in the new Indian democracy post 1947 of the rise of demagogues who could grow into fascist leaders, that danger was very much there because when we talk to Dutt later on, he had it at the back of his mind, maybe not that clearly but it was already there from his reading of Marxism till that point of time, particularly his reading of Trotsky. That sense was there, that awareness was there that all this hullabaloo over democracy could be something very very fatuous and pointless because all the major political issues, issues of class, issues of gender, issues of discrimination at so many levels, all these had been pushed under the carpet in the name of a nationalist consensus during the freedom movement. And these were there, all there, and there was a danger that the national consensus would continue and all these discriminatory, oppressive practices would continue unhampered and provide a base for the rise of fascism through demagoguery. The great nationalist leaders and their pompous high talk. So staging Julius Caesar immediately after Independence at that point of time is, I would say, a historical dramaturgical intervention in Indian theatre. And even as it does that, one of the major problems that he had still, was, let us put it very bluntly, his lack of Bengali, his lack of the language of the people. So he falls into the trap of doing English plays. A few years with Shakespeareana immediately after this Julius Caesar. Then when he settles down back in Kolkata, he gets into doing more Shakespeare, but Shaw comes in and soon after Clifford Odets’s Waiting for Lefty. And very significantly by the early 1950s he starts feeling the uselessness of this exercise playing to a very exclusive elitist alien audience. The need to come to the mainstream, the need to join the mainstream, politically, ideologically, and artistically, this leads in 1952 to the Little Theatre Group transforming itself into a Bengali group with the two productions of Ghosts and A Doll’s House in Bengali. And this was again, if you go into theatre history, for the new mainstream, the non-professional mainstream of Indian theatre, to break away from the actor-managerial tradition and take a look at theatre in its authentic real ground sources, had to take the route of Henrik Ibsen. So it had to begin with Ibsen and Ibsen in Bengali. This was 1952-53, the two years in which he did these two plays and then moves on to do The Russian Question by Konstantin Simonov, a Russian play on political conspiracies and anti-communism growing and being manipulated. For the record, The Russian Question was translated by Saroj Dutta, the legendary poet, journalist, radical who was killed by the police in Calcutta in the 1970s. S.B. : Let’s have that history recorded. The Little Theatre Group with the production of the two Ibsen plays, then Sangbadik, then Neecher Mahal, adapted by Umanath Bhattacharya from The Lower Depths, they move into Bangla theatre and the English-speaking actors, they move out of the group, there is no great tension or struggle or fight over that. There was perfect understanding and The Little Theatre Group, the LTG becomes a Bengali group totally. In 1959 after these plays which they had been going around doing, another important little thing should also be recorded and noted at this point of time, was that in 1950-51, he joined the IPTA. A brief spell officially in IPTA and he directed a version of Tagore’s Bisarjan, and he also acted in a version of Bisarjan which was directed by Ritwik Ghatak. There were two productions of Bisarjan and Utpal Dutt was associated with both. Besides that, another little bit of a performance but something for history to take note of, Bijon Bhattacharya for the IPTA did a play called Kalanka. Kalanka was set in the period of the Second World War in Calcutta and it is about a settlement of these travelling Bedays, snakecharmers and snakewallahs who had come to the city in the famine days and their life, centring on that, rugged, raw, earthy reality at its best, and Bijon Da was a master in handling that in the whole body and the tone and the dialect. His supreme mastery over that. One of the challenges that Bijon Da was handling and addressing at that point of time—even last year I think I spoke about this when I was talking about IPTA—was his commitment to non-actors and making them act, rather than professional actors with a bag of tricks playing around with their tricks, part of that and an extension of that now, even the big professional actors, take them and break them, turn their skills inside out, the skills, the energies that they hold, turn them inside out and make them part of a different theatre experience. Kalanka had as its central matriarchal character the legendary Prabha Devi and she is a kind of matriarch of the Beday community. And there are these soldiers, these GIs who come to pick up young women from the settlement and they have already started trafficking there. And there is this great moment of resistance when Prabha Devi the matriarch of the Beday community, she comes and challenges the soldiers and the GIs are led by two actors, Ritwik Ghatak and Utpal Dutt, directed by Bijon Bhattacharya. This is an IPTA production. Suchetana: He worked even with Panu Pal. S.B. : Yes, but that is later and more in the election campaigns of 1952. Of course, the first elections. So a short period with the IPTA and going the whole hog, being directed by Bijon Bhattacharya, doing his own plays, Neecher Mahal, Little Theatre and the IPTA. IPTA presented Neecher Mahal, I remember having watched scenes, selected scenes from Neecher Mahal and also selected scenes from Shakespeare’s Twelfth Night, Midsummer Night’s Dream in Communist Party rallies as part of the IPTA cultural programme which followed the speeches of the communist leaders. Several of these performances I have seen in makeshift stages as an extension of a public rally. So very much part of that kind of an activist militant theatre. But thanks to his engagement with the Shakespearana and his more comprehensive far-reaching reading and study of theatre, he was committed to creating a theatre-theatre and that leads to inevitably and naturally to the hiring of the Minerva Theatre. So the Little Theatre Group, the LTG takes over Minerva Theatre which is one of the oldest surviving Bengali professional theatre houses. And he did very little change inside or anywhere about it. He really, seriously, wanted as a dramaturg to give his audience a sense of the continuity so that it is the old Bengali theatre reinventing itself but in its own locus, not becoming some adventure somewhere outside or becoming an experiment with a capital E as a kind of a bourgeois fantasy. So stepping into history to carry the history onward but give it a new direction, reorient it, redirect it, that was very central to the Minerva phase of the Little Theatre Group. And starting with Bengali Shakespeare’s and Neecher Mahal, Lower Depths, and one new play called Chhayanat, working with these, and they lead on to Angar which becomes the first big hit of the Minerva theatre. And a kind of a rediscovery, revival of the professional theatre. This was a group of whole timers, not being a large sum but they were being paid professionally, so the pattern, the structure of the professional theatre, that is what the LTG now adopted. And has its own permanent theatre, scope for more experimentation with stagecraft, more complex elaborate stagecraft and bringing in, pooling in resources from different sources. So Angar had Ravi Shankar providing the music, Tapas Sen providing highly complex lighting scenario and Nirmal Guha Roy designing the sets. So the craft of the staging also immediately, the moment it is centre-staged, the dominance of the big actor is curtailed, controlled. So stage craft not for spectacle but stage craft operating on two theoretical levels, to curb, control, locate literally the actor in a milieu, in an environment, turn the singular, individualistic actor into part of an ecology and an ecology which is also historical and political. Because Angar is about the exploitation of the working class directly. So that is at one layer. And so once you enrich the craft of theatre, not for its spectacular values—the spectacular values can come in as a natural product, as a natural extension but that is not the focus, that is not the aim, it is more to locate. So in a way politically it is an extension of the naturalist, realist tradition, that the characters are embedded in a milieu which is so central to the naturalistic philosophy of Ibsen and after, leading on to Gorky. And the great tradition of Moscow Art Theatre. So that is what he brings in historically, dramaturgically into the Bengali theatre tradition when he brings it into Minerva. Suchetana: I think Utpal Dutt kept on saying that a simple and direct art for people can also be aesthetically beautiful. I think, after coming from IPTA, I think that is another idea. But Utpal Dutt himself rejects Angar and says later on that it was not revolutionary enough a play. So can we talk about that, or would you want to look at Angar first and then…. S.B. : No, basically Angar, Ferari Fauj and VIP, these are the three plays which are plays that identify the beginning of this new politics that I am talking about, of reinvesting in the old Bengali theatre and reinventing it in the process with these new inputs. That is a phase which is not in that sense, if you speak of ideology, not so ideologically probing or committed or rich. It is making an entry into theatre, creating a theatre for the first time and then you take on at another level, a more conscious, critical, ideological role. The criticality comes in later. And this I think would really take on much later into the late '60s. And I would say that the more political phase of the Little Theatre Group, that comes in with Kallol. And I think the last masterwork of the earlier phase, this intermediary phase of dealing more with theatre rather than with the ideology, this culminates in a way (in what is) also a fantastic production with great use of craft, great use of music for the first time in a very very rich manner, another extension of theatre, which was Titas. And also I would say it is a historical step with Bijon Bhattacharya coming in centre stage as a performer. Music which had been left out in our theatrical tradition, and yet music has to be there to bring the people in and also layer the text of the play. A text which is all verbal, a text which is all words really cannot convey to a large popular audience. So music and the words, they must have a rich complex interface and only then the meaning, the ideas are transported to the people. So the first time that he is using music very consciously and elaborately is in Titas. So it is again an intervention in history and a very important intervention in history, even having the great folk singer Nirmalendu Chowdhury acting, performing, singing in it, and Bijon Bhattacharya. Of course from Angar to Titas, a very sensitive complex use of melodrama which is so much part of the Bengali folk theatre, popular theatre tradition. A very conscious critical handling of the melodrama, not falling into the rut of melodrama but using it. So this climaxes in a way in Titas. And then into the more political phase of Kallol, Manusher Adhikare and Teer. This is again another phase and a phase in which the initial primary doubts about democracy in practice that came out in his Julius Caesar, these are now taking a more serious political shape. The limitations of democracy, the continuous compromises of democracy, these become his major political concern in Kallol, Manusher Adhikarey and Teer. Suchetana: There are two plays that I want to ask about. One is Ajeya Vietnam and of course we will talk about Teer because it brings out the controversy of Utpal Dutt’s political career in one way and his filmatic career also. I think the Bengali’s relationship with Vietnam is very long and very elaborate. We always relate to Vietnam, and our poets, our litterateurs have always related to Vietnam. Do you think that Ajeya Vietnam in itself is a statement that Dutt made? You spoke about Kallol, you spoke about Teer and you spoke about Manusher Adhikarey, all of this put together, the phase where he defined his theatre. This, can we look at it as defining his ideology, as a phase of defining his ideology. And then what happens, post-Teer is what I want you to talk about. S.B. : Thank you for bringing in Ajeya Vietnam. I should have mentioned Ajeya Vietnam along with the three. I just forgot it. What is very important about Ajeya Vietnam and also Manusher Adhikarey is the international dimension of the politics. Now in all the earlier plays, at least visually, directly, it is here and now. But with Manusher Adhikarey and Ajeya Vietnam is it internationalised. So the larger operation of imperialism and the way imperialism handles relations between communities, between classes and how imperialism dictates the terms of the judiciary. So this larger perspective which is a large enough political perspective rather than the exploitation of the workers here or the hard life of the fishermen, the different communities, how they suffer in India, from there now you are going into a different space, into different politics where you see the operations of different political forces and how these forces operate down to this point. So a larger view, a larger international political view, this comes into place in this phase. I will never forget the electrifying and at the same time the political power of the opening of Ajeya Vietnam theatrically. Let me recall it because it haunts me, my memory, it starts with Utpal Dutt as an American general facing the audience and a group of low level generals or officials, all in full army dress, paraphernalia, facing him in almost a kind of a classroom situation, about eight of them sit with their backs to the audience and Dutt facing us with a stick and board. And there is a map of southeast Asia on the board. And then at one point the screen comes down upon the board and you have a magnified map of southeast Asia and Dutt talking about the importance of American intervention in Vietnam, why it is important politically and he uses a stick as a pointer, hitting on the different sites, spots. And he talks about the American role, the role of the American army, the role of the American state and talks about imperialism in operation. And at one point he goes on showing the different areas, China, India and the different factors, the context. So it is a lesson also in politics for the audience. And giving the American perspective on the global politics of this area. And very theoretically presented, almost in a scholarly, academic manner. No frills, nothing of the kind. Almost unnoticed, the lights go on dimming, very sensitive dimming. We are not aware for a long while that the lights are dimming because we are charged by Dutt’s speech and shadows start looming over, all around. At one point he raises his voice, for the first time he goes into rhetoric. All the rest is very very cold, academic lecturing. And he raises his voice, it is a rhetorical voice and he says, 'it is here that we have to contain Communism for the whole world, otherwise it will spread all over. We can’t afford to do that.' Very dramatic, rhetorical, a different Left altogether and the stage immediately goes absolutely dark. And as it goes dark, a music comes in, a loud music, we can’t see anything and through the loud music you slowly see the entering of the drone of aeroplanes. And then the music goes off, the drones take over. Slow entering into the music of the drone of the flights. Then the drone takes over and there we have a film clip, a documentary film clips out of the darkness which is the bombing. Deadly bombing, the planes swooping down and bombing, about five minutes of that. And with their natural sounds. The drone now gone under, the sounds of the bombing and the flights and everything together. Then in a flash, full lights come on and you are in a medical camp in the battlefield of Vietnam. Banded soldiers being brought in by stretchers, blood dripping, nurses running, right in the whole busy daily situation of a war field camp. And then you get into the story. So very consciously, the point that I am trying to make is that locating Vietnam in time, in history for his Bengali audience. So this is a very conscious political ideological theatre. It has a different idiom altogether. And from this point on, from Ajeya Vietnam on, you have this greater attention to facts, history, information, interpretation of information, reading of information which remain the structure of Kallol, Manusher Adhikarey and Teer. Solidly embedded in information, facts and the different ways of presenting it. Ajeya Vietnam was one way. The political briefing of the American soldiers and generals going into Vietnam in different ways, using newspapers, clippings etc. which would later go into, even later into Ebaar Rajar Pala or a lot of more directly political propagandist plays also. But the beginning is here with these four plays. S.B. : Teer as you know was his treatment of the Naxalite movement and he had joined the Naxalite movement officially. One of the first big rallies, it was not allowed in the Brigade Parade ground or in the Maidan by the police. So it took place near about what is now this small park where you have a Vietnam, small Vietnam sculpture there etc. That was actually the site of the meeting because the meeting was not allowed either at the Brigade Parade Ground or the Ochterlony Monument Maidan which were the major places for the rallies. And he went on to the platform and identified him with the CPIML (Communist Party of India, Marxist-Leninist) officially. And Teer was his contribution to the movement. It was formally shown to, approved, endorsed by Charu Majumdar and Kanu Sanyal personally who came down to watch the rehearsals. Utpal Dutt and Tapas Sen went to Naxalbari, interviewed them, spent time there, gathering information and a lot of that came into Teer, of course. And he was arrested for the second time for Teer but he came out soon after and when he came out Kallol and Teer almost one with the other, they got all embroiled. And he was arrested and then he came out when he signed a bond for Ivory Merchant, he had signed a contract to act in the film The Guru and it was this period when the Naxalite movement had also reached a peak and then was already slipping. The first Left Front government had fallen by then, the government which was led by Ajay Mukherji as chief minister and Jyoti Basu as Deputy chief minister, that had fallen and another ministry had taken over under the leadership of the Bangla Congress. At that stage, this happens, this reaches a climax and he signs a bond declaring that he would never be part of any violent or anti-social, anti-etc. etc. movement against any government and he is whisked away by the producers to do his Bombay shoot. It is such a scandal. That day Little Theatre Group officially expels him from the group and punishes him. Tapas Sen is still the chairman, the president of the Little Theatre Group. So he is officially thrown out. The Little Theatre Group continues working out of Minerva. Dutt comes out. After the shooting he is out of town for a spell. He comes back. And he has to start from scratch. Minerva continues haltingly, still doing Teer and a few other plays but obviously without Dutt, without his charisma etc. and also the marginalisation of the Naxalite movement in Calcutta, it had moved out into other areas but in Calcutta it was cornered. So that crashed virtually but very few people from the old Little Theatre Group came and joined him. He had to start from scratch and that is when the People’s Little Theatre comes into being in 1971. And the People’s Little Theatre which is a new organisation now has a different scenario to address in the sense that it doesn’t have its own theatre, it doesn’t have a professional paid company, so the People’s Little Theatre becomes yet another company in the manner of the so-called good theatre. So the terms of reference are different, the practice is different, the nature of the productions also undergoes radical change, a different kind of theatre comes into being, but again interestingly two things happen, and then I will take your next question, the PLT when it comes on board tries to establish itself with three different plays together. So it is a repertoire of three plays. One is Tiner Talowar. The other is Thikana which is again in the manner of Ajeya Vietnam, all those other plays looking into the history of the Bangladesh War. And almost in the same manner, a lot of information, a lot of news, a lot of the history being brought in and yet family stories, other individual experiences also coming into play but within that setting and within that framework, very much in that tradition. So it is a carry over from that line. Tiner Talowar is a completely different thing but again if you really think of it, it is Dutt again reclaiming the history of the old professional commercial theatre and reinventing it for himself, but entering that tradition rather than—the point that I was trying to make earlier—he was never there for the sake of experiment or a new adventure. It had to be located, it has to be placed in the context of theatre and the context should be there. Only then theatre can draw on its context and have a different kind of life of its own, a vibrancy of its own which an experimental theatre wouldn’t have. It would just have the novelty and the precariousness of something strange happening for the first time ever. So that he wanted to avoid, the continuity, the traditionality of theatre, that was a very central concern. And that comes into play in Tiner Talowar which is a very, very important work. And then a variation and a very interesting variation again on Brecht’s Galileo where he does in the story set in the period of the Guptas, Surya-Shikar which is a take off from Galileo, and it is very interesting again that it is about a recantation under pressure. So in a way it is a personal story being given another dimension. And very recently, just last week, I was reading this wonderful book, Fritz Bennewitz in India, where Bennewitz in his unpublished (for the first time they are here in print), his notes of the Galileo production in Kolkata where he very categorically says that where the Galileo production with Mitra failed, was where Shombhu Mitra very consciously—that is what Bennewitz says very clearly—he was upholding the recantation of Galileo and never recognising what Bennewitz calls the crime and the betrayal of Galileo’s act. Because he was reliving his recantation of a progressive theatre and how from the progressive theatre he moved out again to a theatre of the individual actor at the centre. But Dutt doesn’t do that. Dutt really harps also on what was wrong about the betrayal. Of course, it is a more Brechtian ending. So I would say it is a kind of a self-criticism also at that level, but it was Tiner Talowar which was an outstanding work at so many levels and so many layers. Suchetana: And again the use of music in it. S.B. : At so many levels and just think, when we talk about the music, say the interventions of the vivek, you have to remember that the vivek was never a part of the professional commercial theatre, it was a part of the jatra. And what I think, the more I think about Tiner Talowar, I go back to think about it again and again is that again it is a retelling of the history of the Bengali professional theatre but not just a history but a leap into the imaginary. What the professional theatre could have done, should have done and that dramatic shift from the language of D. L. Roy, Kshirod Prasad and Girish to the language of the Titumir, that sharp shift of language and that is being underscored by the vivek who comes in from the Jatra, from the parallel theatre. So it is the Jatra that takes over as if in an imaginary, the old professional commercial theatre, the theatre for the babus and meant for the babus. With the language changes, the music changes, music plays a completely different role. It is not the music of the Abu Hussains or Ali Babas at all. Suchetana: Will you tell us more about Dutt’s foray into Jatra and how, why he chooses Jatra and how he goes on to travel different parts of Bengal through Jatra? S.B. : One fact has to be put across straightaway. Once he loses Minerva, he loses a very strong given popular reach. That is gone now. And his initial, in this period when he doesn’t have a footing really anywhere, he is treated as a pariah. He gets Jatra assignment from the commercial Jatra. They realise from their end and they are cool businessmen, the Jatrawalas of Chitpur, they realised, well, this man has a reputation, has a standing, has a name but it is now all dirt. So this is our opportunity to grab this man and bring him into our fold, use his reputation because his betrayal of the radical left cause will not matter to the audiences that the Jatra companies were reaching anyway. It just wouldn’t matter there. So he would have his old fame and he had started appearing in films, Bombay films, Calcutta films. So he in Jatra—that is big business. So that is why they offer this thing to Dutt and Dutt takes it. At that stage I had also talked a lot with him. I don’t think there was a very conscious cultural or political choice at that point of time. Let us be very clear about it. That was a very practical commercial offer, a survival strategy for him and he takes it first. That is how, if you ask me, why he went into it, as simple as that. Once he gets a taste of the Jatra for the first time, he was no great Jatra lover. He hadn’t seen Jatras. When he first gets his taste of the Jatra in this very late '60s, he discovers these wonderful actors. And as you know, his first work was Rifle with great Ponchu Sen. And he was very impressed, as he told us later and he writes about it later also, that Ponchu Sen had always done the Daud Khans and those big meaty, larger than life roles, and a wonderful actor, a great actor really. He chooses himself to be a peasant, for the first time ever in his career, Jatra career, free choice, he is given a choice because he is a great actor in that group and he says, I will do Rehmat Sheikh. So this impresses him and the quality of acting, the richness of acting and their easy sharing with the audience because this was Jatra, when he comes into the Jatra in the late '60s, and that period I would say (because that was the period when I was fascinated by the Jatra and watching Jatra madly), when the great actors who had emerged in 1920s and the Jatra had undergone a radical change, they were at their peak, real peak and then old age would take over just at that point. And what fabulous, overpowering performances, Bado Phani-Babu, Chhoto Phani-Babu, Ponchu Sen particularly and the great female impersonators, the next generation of the younger actors like Sujit Pathak, Shekhar Ganguly, Swapan Kumar, the second generation had come in already. So it was wonderful. And the range of their skills, capacities, voices, Bijan Mukherji, all of them, fabulous actors all around, so that was a thrilling experience for Dutt initially. So it was not so much politics but the whole challenge of it and he doesn’t have his old group of actors, he doesn’t have anything, it is just an empty life. So he grabs that and he gets into it. So when he starts and this is before he starts the PLT (People’s Little Theatre), it is still that grey shadowy period, he being treated as a pariah. He thinks—that is his plan, when he starts the PLT, the People’s Little Theatre—to have a parallel organisation called the Vivek Jatra Samaj, and that they would start simultaneously: they were registered simultaneously as two different organisations. So the People’s Little Theatre for proscenium theatre and the Vivek Jatra Samaj to get into the Jatra circuit. And his idea was, and the Jatra companies with whom he was working professionally as playwright director, he never acted in a professional Jatra company, never, no question, he knew where to draw the line. He had expected and maybe they had also promised him loosely that they would help the Vivek Jatra Samaj to get into the Jatra travelling circuit, which they never did. Obviously, they wouldn’t allow that kind of competition. So he was let down very badly and the Vivek Jatra Samaj folded up. They had very few shows in the Jatra circuit and then it just collapsed and it was folded up. And then it was this theatre and for him every year he would be directing and writing one or two at the most Jatra plays. That continued as long as he could. And he had great fun out of that, great excitement out of that and he found a whole new generation of actors, what I am calling the second generation that had emerged in the '60s and they were in their prime in the '70s and '80s particularly his favourite actors, Shekhar Ganguly, Indra Lahiri, Kanaklata, Shibdas Mukherjee, and they had wonderful rapport with him. So he could experiment with a lot of things because they were so capable. And there were rare occasions later on where Shekhar Ganguly also took part in one or two of the PLT performances, much later of course. Suchetana: Now coming to the other aspect, that is the theoretician Utpal Dutt, the one who has written about dramas theoretically as he has practised also, and you would be the best person to comment because you have edited his essays. And two things that I would want to ask you, one is Brecht’s influence on him as a dramaturg. I have read his writing where he says that doing Epic Theatre in India is not possible because our audiences are very emotional. But when he is writing, Chayer Dhonya is almost equivalent to Messingkauf Dialogues but not really. And second is his proposal about revolutionary theatre. So first, if you could talk about the theoretical aspect of Dutt's writing about Indian drama which I think is very important because post-Independence you really do not find someone writing consistently over a long period of time. S.B. : And talking out of his practice also, rationalising his practice, explaining his practice also in theoretical terms. What I would say is that as far as Brecht is concerned, he has made it very clear. He has written again and again on Brecht, his great admiration for Brecht and at the same time how Brecht cannot be transplanted into India or Brecht cannot be used in India because it has a different kind of a dramatic culture, theatrical culture and conventions etc. And so he tries to find out an independent, a different political game plan for Indian theatre. And particularly I would say for Bengali theatre because in his extensive writing which I have edited and which I am working on still, we have published two volumes, so there will be two more volumes, I have gone through these thoroughly, he never really cared to study the theatre histories, the theatre convention, the theatre practices of the rest of India. There is no evidence of that at all. You have excellent essays on Chinese theatre, on Greek theatre, on modern European theatre and Shakespeare of course. But completely unconcerned about, ignorant about the Indian theatre experience and its variation, its diversities in the different regional cultures and their regional histories, which I find inexplicable. And drawing on that, what I think is that all his life, though he has written a lot of theory, his primary concern was not theory so much as rationalising his own theatre practice at different stages, at different points of his trajectory. So every time he does something, the changes, the shifts which we have discussed in great detail, why, where, what pressures, what histories operate there and his choices, very clearly made choices. So I think that if you really take his theory, his theorisation out of the story of his theatre practice, it doesn’t make much sense. Suchetana: Do you think a revolutionary theatre is supposed to preach revolution and as you say that his writing really possibly doesn’t make much sense until one is looking at his practice, at this theatre, do you think that this kind of revolutionary theatre that he was writing about was at all possible in India where he was sitting and writing. I mean what was he foreseeing really? S.B. 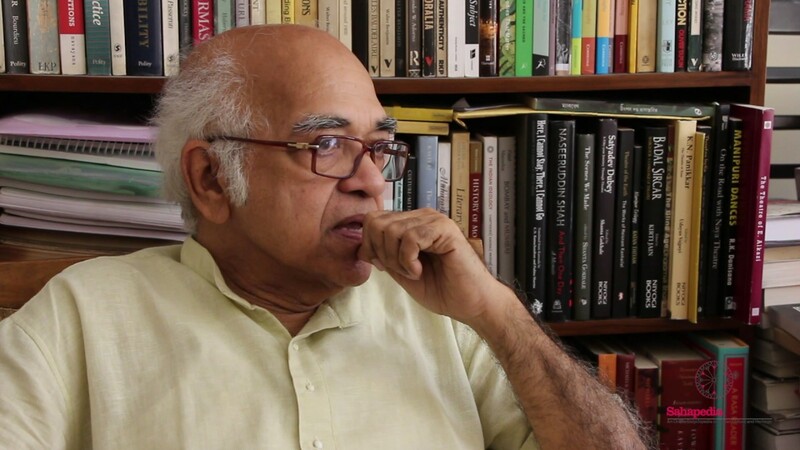 : One thing you have to recognise immediately is that somehow after his short camaraderie with the Naxalites and the CPI(ML) he never became part of any political party or movement as such. He remained a fellow traveller of the CPI(M). The CPI(M) treated him with great caution, never projected him as their playwright. So a kind of a respectful distance and collaboration, that was his relationship with the CPI(M). In the process, now if you are really thinking of a revolutionary theatre in any way, you can’t start it or have it independently in your theatrical practice, cut off from political activism. So political activism and theatre activism can come together, have to come together to make a revolutionary theatre where theatre really contributes to a political or social revolution. That is what is revolutionary theatre. So if you are really thinking of a revolutionary theatre, a theatre which activates, churns out political change or contributes to a political process, a process of change, it has to work with an organisation. So my favourite terminology at the moment is—I am talking a lot about this and writing a lot about this—is that there should be a relationship of involvement, of engagement between what I call the political left and the cultural left. So they retain and they maintain their identities and their practice and honing their skills and art, the art of propaganda, the art of creative thinking that it can circulate and disseminate among people at that level which is the job of the cultural left, not of the political left. So simultaneous work at these two levels and a kind of a regular contact interaction between the two. Only this can lead onto revolutionary theatre which is a plunge which Dutt had never really taken.